Unique to EuroCave is the Hydro T system. A cassette of clay supplied with PURE and Compact models, allowing you to increase the water content of the air which is recirculated inside the cabinet in dryer environments such as garages in winter and centrally heated houses. Current Compact models display the humidity level within the cabinet for your assurance that the cork integrity is being maintained over time. EuroCave PURE & Compact cabinets have warning alarm icons if the temperature fluctuates outside normal parameters, if the door is left open (audible), if the humidity drops too low or if there is a power issue. The PURE & Compact cabinets are illuminated as standard by a UV free, functional and aesthetic cold LED lighting system. To further ensure minimal UV light, the double glazed clear glass doors are UV screened. The lighting has 3 settings. ON/OFF/ON when the door is open. The PURE & Compact ranges are fan assisted internally to maintain an even and consistent temperature and flow of fresh air. This may also help to discourage mould. Electronic LCD display and touch buttons for precise temperature control. All EuroCave products are fitted with locks and supplied with keys. EuroCave was the first wine cabinet manufacturer and has been innovating for over 35 years, making dedicated wine cabinets for 'cellaring' or 'serving' wine. EuroCave does not make refrigerators. EuroCave versatile rolling shelves are unique. 12 bottles of wine (8 on Compact) are layered flat, front to back on a sliding/rolling shelf, that you can pull out with your little finger. 12 bottles of wine weigh about 15kg. Each bottle rests on its own adjustable platform, the arrangement of which can be tailored to suit the many wine bottle sizes on the market, including magnums. EuroCave cabinets have one of the highest levels of insulation on the market. Even when switched off and loaded with wine, the internal space remains cool and constant. 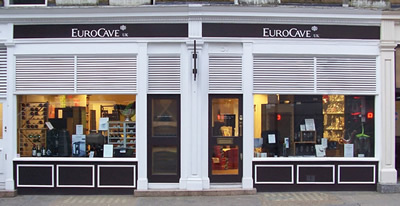 A EuroCave can be kept in any environment, because it heats internally as well as cools. Hot or cold ambient, below 0°C to +35°C. (not a 3 temp. or multi temp cabinet) A single temperature unit is most suitable for a garage with a solid door. Wine may be kept in a EuroCave for many, many years as it maintains a perfect cellar environment, for maturing wine. Full servicing is offered during the years of ownership, initially being covered by a 3yr parts and labour guarantee. Each cabinet is reinforced with a steel frame. This enables it to support the weight of up to 200 bottles in a large cabinet. Few other cabinets with approximately these dimensions can match this capacity. A good way to judge value is to divide the cost by the realistic initial capacity. Many manufacturers artificially increase their capacity statements based on having impractically few shelves. The internal lining of the cabinet is entirely aluminium, this is unique to EuroCave. Aluminium conducts heat and cold far better than plastic, creating a superior cellar environment. Condensation can form far better on cool aluminium than plastic, helping to maintain humidity. EuroCave cabinets are naturally ventilated through holes in the rear wall, allowing fresh air to constantly flow around the cabinet. This creates an even temperature throughout and requires no other system to ventilate the air. It is this continuous flow of fresh (humid) air that maintains a suitable humidity level. The compressor is mounted on vibration free 'silent' blocks, making it one of the quietest, if not the quietest cabinet on the market. We offer a 3 year guarantee within the UK as standard and employ dedicated engineers for all your after sales and servicing requirements. Many useful tips on addressing simple issues with your cabinet are here as well as the knowledgeable staff at EuroCave UK who are on hand to assist.